Founded in 1974 with a small hotel in Mazatlan, Grupo Vidanta has steadily expanded to become known across the world as a visionary leader in the development and operation of vacation destinations, luxury hotels, golf courses, real estate, tourism infrastructure, and entertainment. Grupo Vidanta's luxury vacation brand, Vidanta, boasts an impressive portfolio of entertainment and destinations resorts along the most coveted beaches in Mexico, including Nuevo Vallarta, Riviera Maya, Los Cabos, Acapulco, Puerto Peñasco, and Puerto Vallarta. Grupo Vidanta also has multiple properties in Mazatlán. Grupo Vidanta also is responsible for luxury resort hotel brands, including Grand Luxxe, The Grand Bliss, The Grand Mayan, The Bliss, Mayan Palace, Sea Garden, and Ocean Breeze, with more under development. Grupo Vidanta’s real estate division has built and sold more than 2,000 vacation homes in Mexico. In addition, Vidanta Golf, the largest golf course operator in Mexico, offers the finest selection of courses in Latin America, including two Nicklaus Design Golf Courses and the Norman Signature Golf Course. The company’s construction group developed Mexico’s first privately built and owned airport, Mar de Cortés International Airport in Puerto Peñasco, and the Cirque du Soleil Theater at Vidanta Riviera Maya. Our mission is to create the most extraordinary vacation and entertainment experiences in the world, where our guests can share moments filled with happiness and harmony; to inspire generations of happiness; and to create a workplace that promotes health, safety, and professional opportunity for all of our 17,000 employees; to protect the environment through sustainable and eco-conscious operational procedures and construction processes. At Grupo Vidanta, we operate every facet of our business with the utmost integrity. We are committed to protecting and promoting the interests of our community and the environment. That’s why we take great care to implement extensive green policies and programs and use third-party organizations to audit our practices. Through our investment in non-profit foundations and employee training and retention programs, we support our resort communities and socially conscious initiatives across Latin America. Our motto, “Inspiring Generations of Happiness,” doesn’t simply apply to our guests or clients, it applies to everyone in the Grupo Vidanta Family and surrounding community. Our people are our greatest asset and, by creating opportunities for them to succeed, we create an environment of respect and service that permeates every guest interaction. Grupo Vidanta is among Latin America’s most revered employers, and has been named #6 on the 2016 list of Great Places to Work® in Mexico. We know our guests' vacation time is precious, so we strive to make every moment an extraordinary one by anticipating every need. We have an internal staff of 17,000 employees who diligently work day and night to deliver the first-rate service experiences that our guests deserve and have come to expect. Environmental protection is an integral part of our corporate policies and practices. Throughout our resorts, we use efficient technologies, have instituted extensive recycling and composting programs, and use environmentally conscious vehicles for almost all on-resort transportation. Our private construction company uses local materials and builds all of our properties with the utmost respect for the environment. We are proud of our comprehensive dedication to ecological protection and honored to have this dedication recognized with the EarthCheck Gold Certification. Both Grand Luxxe Nuevo Vallarta and Grand Luxxe Riviera Maya have been recognized with the AAA Five Diamond Award—the highest honor AAA bestows upon hotels—in recognition for their exceptional service and amenities. The Grand Mayan and The Grand Bliss properties have earned the AAA Four Diamond Award recognition for consistently delivering their guests a luxurious experience, with top-notch services and amenities. Several of Grupo Vidanta's properties have been awarded Cristal Certification for their employees’ dedication to sharing their technical and specialized knowledge of hotel facilities and food and beverage management and to promoting hygienic conditions in the sanitary and cooking environments. From the beginning, Grupo Vidanta has put numerous sustainability and conservation practices in place to honor and respect the natural beauty of Mexico and its communities. For this, Grupo Vidanta has been recognized by The Mexican Center for Philanthropy (CEMEFI) as a company committed to forever-improving socially responsible management as part of its culture and business strategy. 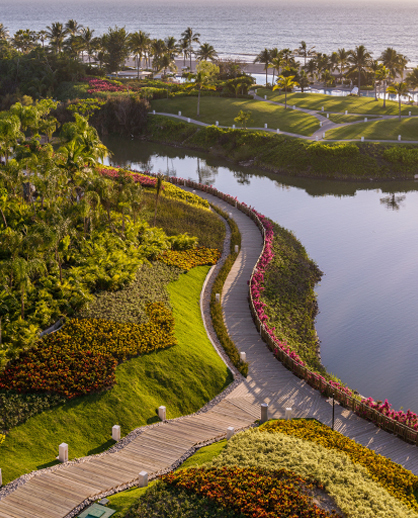 Grupo Vidanta properties are acclaimed for protecting the environment and have been honored with EarthCheck Gold Certification—the highest level reserved for those companies that meet the most stringent of standards—for eleven consecutive years. The Great Place to Work® award was created in 1991 to honor companies that offer their employees much more than just jobs. For 2018, we have been named to the top 10 on the list of Great Places to Work® in Mexico. Grupo Vidanta has been recognized among the top Mexico-based companies each of the previous eight years. We have also been classified, by the Secretary of Labor and Social Welfare, through the Gilberto Rincon Gallardo recognition in 2012, as a company that gives work opportunities to the disabled and other discriminated groups and takes action to promote diversity and equal opportunity and end discrimination. Grupo Vidanta is proud to offer the highest quality service in all of its developments. This guiding principle of our business was recognized officially on Feb. 12, 2013 by Resort Condominiums International (RCI). The awards were the result of our having obtained the highest possible points in client surveys, for achieving standards of excellence in lodging and hospitality in the resort. Some of the points evaluated in the surveys were: check in, check out, overall maintenance of the development, room maintenance, hospitality and housekeeping. The 2 recognitions obtained were RCI Gold Crown Resort and Excellence in Service, both received for all 3 of the following resorts: The Grand Mayan, Mayan Palace, and Sea Garden. The Excellence in Service recognition is an additional recognition awarded for extraordinary service. Without a doubt, these recognitions are an incentive to us to keep improving and to continue offering better service every day.